If you're looking for a great way to get your body in shape with little effort, then this whole body vibration machine is perfect for you. This portable vibration platform burns fat and tightens skin by increasing your metabolism for your whole body. The vibrations reshape the body in the hip, waist and abdomen. You can increase muscle tone, strength, circulation and flexibility in 10 minutes a day, 3 times a week. 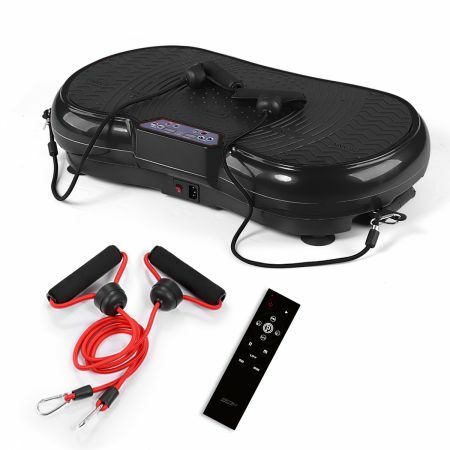 Kick your workout into high gear and order your ultra-slim body vibration machine today! As I read on all reviews they're telling the truth love, you guys don't lie thank you. Highly recommended, received it today. Love this vibration plate at Genkifitness. This works great and delivered perfectly. The only reason I didn't give it 5 stars is because the instruction manual was weak. I would have liked to know how long it should be used, if it is to be used daily, etc. I would have to download a manual from a competing product. Love the vibration platform fitness exercise. And glad the remote was included this time. Feel the burn. Just step on the vibration plate. Looking forward to getting the vibrating results. So far it has been great, I am slowly working up to 3 10 minute workouts. Takes up very little space, you can exercise while watching TV.